The team at Romero Centre are blown away by the amount of support we have received from the community this Christmas! We wish to extend our deepest gratitude to all supporters who have gone above and beyond to ensure people seeking asylum experience joy and hope this festive season. Below are just a few of the wonderful groups that have banded together in the spirit of Christmas to provide support to people seeking asylum in Brisbane. Alison and the Backpacks for Refugee Kids at Christmas (BFRKC) community committed to supporting Romero Centre again this year, donating 45 backpacks and 41 extra-large Christmas hampers for children and families seeking asylum. The backpacks contained essential items and gifts for children and the hampers included three weeks’ worth of non-perishable, essential food items, personal hygiene and cleaning products. When we visited Alison to collect some of the backpacks and hampers, she made one thing very clear: this incredible project “would not be possible without the help of thoughtful, generous and compassionate people”. Thank you to the BFRKC community – your generosity and kindness will have a lasting impact on families this Christmas! Romero Centre employees collecting hampers and backpacks from Alison Reynolds, founder of BFRKC. Federal Loves Refugees (FLR) recently hosted a Federal Christmas Market to gather Christmas presents for children and handbags for women supported through the Romero Centre. This is just one example of the wonderful work FLR undertakes to share hope and joy with people seeking asylum. To Julie, Fran, Peta, Mark and the HUGE community of supporters at Federal Loves Refugees – thank you so much! Your ongoing support this year – and particularly throughout this Christmas season – has had a significant impact on the vulnerable people who visit the Romero Centre. The countless fundraisers and donation drives you have coordinated on our behalf is astounding and we feel honoured to work alongside you to provide support to people seeking asylum in Brisbane. Pictured above are just some of the gifts donated to Romero Centre by Federal Loves Refugees. 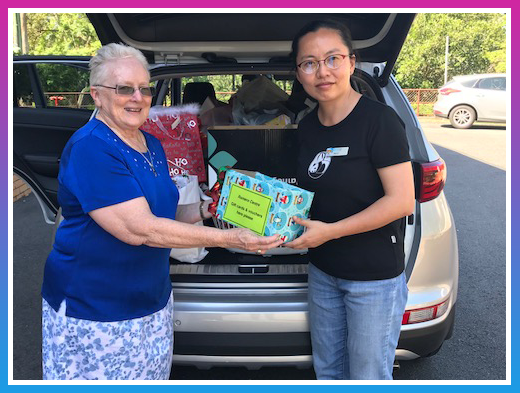 We recently collected a very generous Christmas donation from the Sisters of Mercy and the staff at the Brisbane Congregation Office, including a large box full of gift cards to provide people seeking asylum with general necessities this Christmas season. The Sisters of Mercy have supported the Romero Centre in countless ways throughout 2017, always inspiring us to act with compassion and kindness. 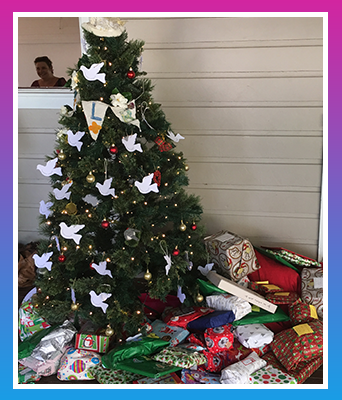 We want to say thank you to the Sisters of Mercy and all the staff at the Brisbane Congregation Office for your selfless giving in the spirit of Mercy this Christmas. One of our Romero Centre workers collecting the gifts from the Sisters of Mercy. The team at Taste of Saffron Restaurant Greenslopes reached out to us recently to ask how they could support people seeking asylum this Christmas and arranged delicious catering for guests at our Romero Centre Christmas Gathering on 22 December. What a thoughtful way of blessing families seeking asylum as we celebrate the season together! Thank you Saffron Restaurant for your generosity and kind words! 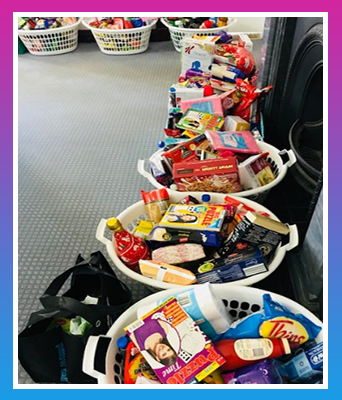 Thank you to the staff at Mercy Community Services’ Head Office and Aged Care Services for your generous donation of large Christmas hampers and toiletry bags for families supported through Romero Centre. The hard work and effort put into this donation drive is a testament to your selflessness and goodwill and we are humbled to work alongside you as we support people seeking asylum. Pictured above are just some of the items collected for the hampers. A heartfelt thank you to each and every one of our supporters who have generously donated food, gifts and emergency items for people seeking asylum in Brisbane this Christmas season. We are humbled by the sheer selflessness and compassion of our extended Romero Centre community. Thank you. You too can make a difference for people seeking asylum. There are a number of ways you can get involved, from organising a fundraising event to coordinating a goods drive at your work, business, school or church. It’s fun, easy and rewarding to make a donation and assist in providing the right kind of support, when it’s needed the most. Your time and generosity is appreciated! Mercy Community Services is helping build a world where people, families and communities are strong in spirit, healthy and connected. Donations over $2 are tax deductible.